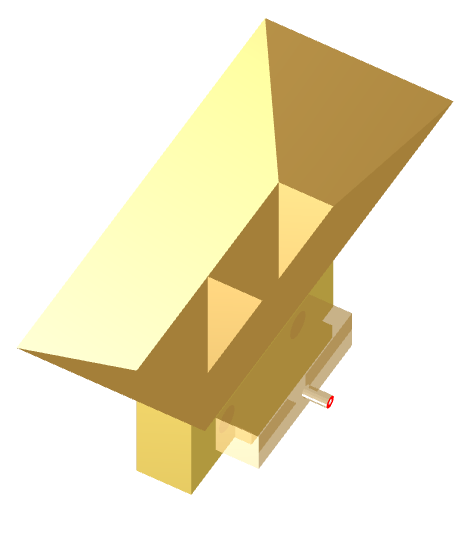 Image of the Short dual-waveguide-fed pyramidal horn. 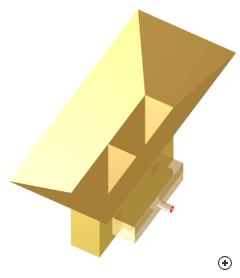 The Short dual-waveguide-fed pyramidal horn antenna is a modification of the conventional pyramidal horn. The modification includes a dual waveguide feed, which in turn is fed with a single coaxial feed and divider. The dual waveguide feed improves the aperture efficiency of the pyramidal horn, resulting in a shorter flare length, when compared to a conventional pyramidal horn with the same boresight gain. The input impedance of the dual-waveguide horn is designed for a 50 Ohm system, but may be optimized for other impedance systems by varying the divider dimensions and position, as well as the length of the feed pins in the waveguides. The gain can vary from 12dBi to 17dBi, but the aperture efficiency drops quickly as the gain increases. This antenna is typically used as an array element or as a reflector feed. Comparison of the flare-length and aperture area of a conventional pyramidal horn and a dual-waveguide-fed horn, showing the shortened axial length required to achieve the same gain and aperture area for the dual-waveguide-fed horn.